This name uses Spanish naming customs: the first or paternal family name is Vásquez de Coronado and the second or maternal family name is Luján. Francisco Vázquez de Coronado y Luján (Spanish pronunciation: [fɾanˈθisko ˈβaθkeθ ðe koɾoˈnaðo]; 1510 – 22 September 1554) was a Spanish conquistador and explorer who led a large expedition from Mexico to present-day Kansas through parts of the southwestern United States between 1540 and 1542. Vázquez de Coronado had hoped to reach the Cities of Cíbola, often referred to now as the mythical Seven Cities of Gold, which is a term not invented until American gold-rush days in the 1800s. His expedition marked the first European sightings of the Grand Canyon and the Colorado River, among other landmarks. His name is often Anglicized as "Vasquez de Coronado". Vázquez de Coronado was born into a noble family in Salamanca, Spain, in 1510 as the second son of Juan Vázquez de Coronado y Sosa de Ulloa and Isabel de Luján. Juan Vázquez held various positions in the administration of the recently captured Emirate of Granada under Iñigo López de Mendoza, its first Spanish governor. Francisco Vázquez de Coronado went to New Spain (present-day Mexico) in 1535 at about age 25, in the entourage of its first Viceroy, Antonio de Mendoza, the son of his father's patron and Vázquez de Coronado's personal friend. In New Spain, he married twelve-year-old Beatriz de Estrada, called "the Saint" (la Santa), sister of Leonor de Estrada, ancestor of the de Alvarado family and daughter of Treasurer and Governor Alonso de Estrada y Hidalgo, Lord of Picón, and wife Marina Flores Gutiérrez de la Caballería, from a converso Jewish family. Vázquez de Coronado inherited a large portion of a Mexican encomendero estate through Beatriz and had eight children by her. Vázquez de Coronado was the Governor of the Kingdom of Nueva Galicia (New Galicia), a province of New Spain located northwest of Mexico and comprising the contemporary Mexican states of Jalisco, Sinaloa and Nayarit. In 1539, he dispatched Friar Marcos de Niza and Estevanico (more properly known as Estevan), a survivor of the Narváez expedition, on an expedition north from Compostela toward present-day New Mexico. When de Niza returned, he told of a city of vast wealth, a golden city called Cíbola, whose Zuni residents were assumed to have killed Estevan. Though he did not claim to have entered the city of Cíbola, he mentioned that it stood on a high hill and that it appeared wealthy and as large as Mexico City. Vázquez de Coronado assembled an expedition with two components. One component carried the bulk of the expedition's supplies, traveling via the Guadalupe River under the leadership of Hernando de Alarcón. The other component traveled by land, along the trail on which Friar Marcos de Niza had followed Esteban. Vázquez de Coronado and Viceroy Antonio de Mendoza invested large sums of their own money in the venture. Mendoza appointed Vázquez de Coronado the commander of the expedition, with the mission to find the mythical Seven Cities of Gold. This is the reason he pawned his wife's estates and was lent 70,000 pesos. In the autumn of 1539, Mendoza ordered Melchior Díaz, commander of the Spanish outpost at San Miguel de Culiacán, to investigate Friar de Niza's findings, and on November 17, 1539, Díaz departed for Cíbola with fifteen horsemen. At the ruins of Chichilticalli, he turned around because of "snows and fierce winds from across the wilderness". Díaz had encountered Vázquez de Coronado before he had departed San Miguel de Culiacán, and reported that initial investigations into Friar de Niza's report disproved the existence of the bountiful land he had described. Díaz's report was delivered to Viceroy Mendoza on March 20, 1540. Vázquez de Coronado set out from Compostela on February 23, 1540, at the head of a much larger expedition composed of about 400 European men-at-arms (mostly Spaniards), 1,300 to 2,000 Mexican Indian allies, four Franciscan friars (the most notable of whom were Juan de Padilla and the newly appointed provincial superior of the Franciscan order in the New World, Marcos de Niza), and several slaves, both natives and Africans. Many other family members and servants also joined the party. He followed the Sinaloan coast northward, keeping the Gulf of California on his left to the west until he reached the northernmost Spanish settlement in Mexico, San Miguel de Culiacán, about March 28, 1540, whereupon he rested his expedition before they began trekking the inland trail. Aside from his mission to verify Friar de Niza's report, Melchior Díaz had also taken notice of the forage and food situation along the trail, and reported that the land along the route would not be able to support a large concentrated body of soldiers and animals. Vázquez de Coronado, therefore, decided to divide his expedition into small groups and time their departures so that grazing lands and water holes along the trail could recover. At intervals along the trail, Vázquez de Coronado established camps and stationed garrisons of soldiers to keep the supply route open. For example, in September 1540, Melchior Díaz, along with "seventy or eighty of the weakest and least reliable men" in Vázquez de Coronado's army, remained at the town of San Hieronimo, in the valley of Corazones, or Hearts. Once the scouting and planning was done, Vázquez de Coronado led the first group of soldiers up the trail. They were horsemen and foot soldiers who were able to travel quickly, while the main bulk of the expedition would set out later. After leaving Culiacan on April 22, 1540, Vázquez de Coronado followed the coast, "bearing off to the left", as Mota Padilla says, by an extremely rough way, to the Sinaloa River. The configuration of the country made it necessary to follow the river valley until he could find a passage across the mountains to the course of the Yaqui River. He traveled alongside this stream for some distance, then crossed to the Rio Sonora, which he followed nearly to its source before a pass was discovered. On the southern side of the mountains he found a stream he called the Nexpa, which may have been either the Santa Cruz or the San Pedro in modern Arizona of modern maps, most likely the northward-flowing San Pedro River. The party followed this river valley until they reached the edge of the wilderness, where, as Friar Marcos had described it to them, they found Chichilticalli. Chichilticalli is in southern Arizona in the Sulfur Springs Valley, within the bend of the Dos Cabezas and Chiricahua Mountains. This fits the chronicle of Laus Deo description, which reports that "at Chichilticalli the country changes its character again and the spiky vegetation ceases. The reason is that ... the mountain chain changes its direction at the same time that the coast does. Here they had to cross and pass the mountains in order to get into the level country." There Vázquez de Coronado met a crushing disappointment: Cíbola was nothing like the great golden city that de Niza had described. Instead, it was just a village of simple pueblos constructed by the Zuni Native Americans. The soldiers were upset with de Niza for his mendacious imagination, so Vázquez de Coronado sent him back south to New Spain in disgrace. Despite what is shown in the accompanying map, on-the-ground research by Nugent Brasher beginning in 2005 revealed evidence that Vázquez de Coronado traveled north between Chichilticalli and Zuni primarily on the future New Mexico side of the state line, not the Arizona side as has been thought by historians since the 1940s. Also, most scholars believe Quivira was about thirty miles east of the great bend of the Arkansas River, ending about twenty miles west-southwest of the location depicted on the map, with Quivira being mostly on tributaries of the Arkansas River instead of directly on the Kansas River. For details, see the heading below, "Location of Quivira...."
Vázquez de Coronado traveled north on one side or the other of today's Arizona–New Mexico state line, and from the headwaters of the Little Colorado River, he continued on until he came to the Zuni River. He followed the Zuni until he found the region inhabited by the Zuni people. The members of the expedition were almost starving and demanded entrance into the village of Hawikuh (of which the preferred Zuni word is Hawikku). The natives refused, denying the expedition entrance to the village. Vázquez de Coronado and his expeditionaries attacked the Zunis. The ensuing skirmish constituted the extent of what can be called the Spanish "Conquest of Cíbola". During the battle, Vázquez de Coronado was injured. He never personally led his men-at-arms in any subsequent battles. [citation needed] During the weeks that the expedition stayed at Zuni, he sent out several scouting expeditions. Three leaders affiliated with the Vázquez de Coronado expedition were able to reach the Colorado River. The first was Hernando de Alarcón, then Melchior Díaz and lastly Garcia Lopez de Cárdenas. Alarcón's fleet was tasked to carry supplies and to establish contact with the main body of Vázquez de Coronado's expedition but was unable to do so because of the extreme distance to Cibola. He traveled up the Sea of Cortés and then the Colorado River. In this exploration, he hauled some supplies for Vázquez de Coronado, but eventually, he buried them with a note in a bottle. Melchior Díaz was sent down from Cíbola by Vázquez de Coronado to take charge of the camp of Corazones and to establish contact with the fleet. Soon after arriving at the camp he set out from the valley of Corazones in Sonora and traveled overland in a north/northwesterly direction until he arrived at the junction of the Colorado River and Gila River. There the local natives, probably the CocoMaricopa (see Seymour 2007b), told him that Alarcón's sailors had buried supplies and left a note in a bottle. The supplies were retrieved, and the note stated that Alarcón's men had rowed up the river as far as they could, searching in vain for the Vázquez de Coronado expedition. They had given up and decided to return to their departure point because worms were eating holes in their boats. Díaz named the river the "Firebrand (Tizón) River" because the natives in the area used firebrands to keep their bodies warm in the winter. Díaz died on the trip back to the camp in the valley of the Corazones. While at Hawikuh, Vázquez de Coronado sent another scouting expedition overland to find the Colorado River, led by Don Garcia López de Cárdenas. The expedition returned to Hopi territory to acquire scouts and supplies. Members of Cárdenas's party eventually reached the South Rim of the Grand Canyon, where they could see the Colorado River thousands of feet below, becoming the first Europeans to do so. 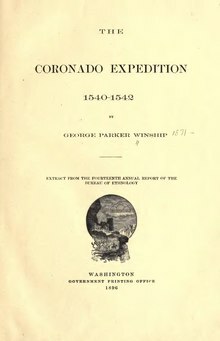 After trying and failing to climb down into the canyon to reach the river, the expedition reported that they would not be able to use the Colorado River to link up with Hernando de Alarcón's fleet. After this, the main body of the expedition began its journey to the next populated center of pueblos, along another large river to the east, the Rio Grande in New Mexico. Hernando de Alvarado was sent to the east, and found several villages around the Rio Grande. Vázquez de Coronado had one commandeered for his winter quarters, Coofor, which is across the river from present-day Bernalillo near Albuquerque, New Mexico. During the winter of 1540–41, his army found themselves in conflict with the Rio Grande natives, which led to the brutal Tiguex War. This war resulted in the destruction of the Tiguex pueblos and the deaths of hundreds of Native Americans. From an Indian the Spanish called "the Turk" (el turco), Vázquez de Coronado heard of a wealthy civilization called Quivira far to the east. In spring 1541 he led his army and priests and Indian allies onto the Great Plains to search for Quivira. The Turk was probably either a Wichita or a Pawnee and his intention seems to have been to lead Vázquez de Coronado astray and hope that he got lost in the wilderness. With the Turk guiding him, Vázquez de Coronado and his army might have crossed the flat and featureless steppe called the Llano Estacado in the Texas Panhandle and Eastern New Mexico, passing through the present-day communities of Hereford and Canadian. The Spanish were awed by the Llano. "The country they [the buffalo] traveled over was so smooth that if one looked at them the sky could be seen between their legs." Men and horses became lost in the featureless plain and Vázquez de Coronado felt like he had been swallowed up by the sea. An intriguing event was Vázquez de Coronado's meeting among the Teyas an old blind bearded man who said that he had met many days before "four others like us". He was probably talking about Cabeza de Vaca, who with Esteban and two other Spanish survivors of the Narváez expedition to Florida made his way across southern Texas six years before Vázquez de Coronado. In 1993, Jimmy Owens found crossbow points in Blanco Canyon in Crosby County, Texas, near the town of Floydada in Floyd County. Archaeologists subsequently searched the site and found pottery sherds, more than forty crossbow points, and dozens of horseshoe nails of Spanish manufacture, plus a Mexican-style stone blade. This find strengthens the evidence that Vázquez de Coronado found the Teyas in Blanco Canyon. After more than thirty days journey, Vázquez de Coronado found a river larger than any he had seen before. This was the Arkansas, probably a few miles east of present-day Dodge City, Kansas. The Spaniards and their Indian allies followed the Arkansas northeast for three days and found Quivirans hunting buffalo. The Indians greeted the Spanish with wonderment and fear but calmed down when one of Vázquez de Coronado's guides addressed them in their own language. Vázquez de Coronado was escorted to the further edge of Quivira, called Tabas, where the neighboring land of Harahey began. He summoned the "Lord of Harahey" who, with two hundred followers, came to meet with the Spanish. He was disappointed. The Harahey Indians were "all naked -- with bows, and some sort of things on their heads, and their privy parts slightly covered". They were not the wealthy people Vázquez de Coronado sought. Disappointed, he returned to New Mexico. Before leaving Quivira, Vázquez de Coronado ordered the Turk garroted. The Turk is regarded as an Indian hero in a display at Albuquerque's Indian Pueblo Cultural Center because he led Vázquez de Coronado onto the Great Plains and thus relieved the beleaguered pueblos of Spanish depredations for at least a few months. Archaeological evidence suggests that Quivira was in central Kansas with the western-most village near the small town of Lyons on Cow Creek, extending twenty miles east to the Little Arkansas River, and north another twenty miles to the town of Lindsborg on a tributary of the Smoky Hill River. Tabas was likely on the Smoky Hill River. Archaeologists have found numerous 16th-century sites in these areas that probably include some of the settlements visited by Vázquez de Coronado. Vázquez de Coronado returned to the Tiguex Province in New Mexico from Quivira and was badly injured in a fall from his horse "after the winter was over", according to the chronicler Castañeda—probably in March 1542. During a long convalescence, he and his expeditionaries decided to return to New Spain (Mexico). Vázquez de Coronado and his expedition departed New Mexico in early April 1542, leaving behind two friars. His expedition had been a failure. Although he remained governor of Nueva Galicia until 1544, the expedition forced him into bankruptcy and resulted in charges of war crimes being brought against him and his field master, Cárdenas. Vázquez de Coronado was cleared by his friends on the Audiencia, but Cárdenas was convicted in Spain of basically the same charges by the Council of the Indies. Vázquez de Coronado remained in Mexico City, where he died of an infectious disease on September 22, 1554. He was buried under the altar of the Church of Santo Domingo in Mexico City. Vázquez de Coronado caused a large loss of life among the Puebloans, both from the battles he fought with them in the Tiguex War and from the demands for food and clothing that he levied on their fragile economies. However, thirty-nine years later when the Spanish again visited the Southwestern United States, they found little evidence that Vázquez de Coronado had any lasting cultural influences on the Indians except for their surprise at seeing several light-skinned and light-haired Puebloans. See: The Chamuscado and Rodriguez Expedition and Antonio de Espejo. In 1952, the United States established Coronado National Memorial near Sierra Vista, Arizona to commemorate his expedition. Indiana Jones and the Last Crusade references the "Cross of Coronado". According to the film, this gold cross, discovered in a Utah cave system, was given to Vázquez de Coronado by Hernán Cortés in 1521. Such an event never happened because Vázquez de Coronado would have been 11 or 12 years old in 1521 and still living in Spain. In addition, when Indy captures the cross from robbers aboard a ship off the coast of Portugal, the ship can be seen to be named 'The Coronado'. The song Hitchin' to Quivira from independent singer-songwriter Tyler Jakes's 2016 album Mojo Suicide is based on the story of Vázquez de Coronado's expedition. The song Coronado And The Turk from singer-songwriter Steve Tilston's 1992 album Of Moor And Mesa is based on the story of Vázquez de Coronado's expedition. There is a large hill just northwest of Lindsborg, Kansas, that is called Coronado Heights. The former owner of the land built a small castle atop the hill to commemorate Vázquez de Coronado's 1541 visit to the area. The castle and the area around it is now a public camping and recreation area. The soft sandstone rocks at the peak of the hill are covered in the names of past visitors to the area. Coronado High Schools in Lubbock, Texas, El Paso, Texas, Colorado Springs, Colorado, and Scottsdale, Arizona, were named for Vázquez de Coronado. Because a don is a name for a Spanish nobleman, the Coronado Don became the school mascot in Scottsdale. Bernalillo, New Mexico, calls itself the "City of Coronado" because he stayed there for two winters. Coronado Center, a two-story indoor shopping mall in Albuquerque, New Mexico is named after Vázquez de Coronado. Coronado Road in Phoenix, Arizona, was named after Vázquez de Coronado. Similarly, Interstate 40 through Albuquerque has been named the Coronado Freeway. Coronado, California is not named after Francisco Vázquez de Coronado, but is named after Coronado Islands, which were named in 1602 by Sebastián Vizcaíno who called them Los Cuatro Coronados (the four crowned ones) to honor four martyrs. Beatriz was the second daughter of Alonso de Estrada and Marina de la Caballería; niece of Diego de Caballeria. The Estrada-Coronado union was a carefully calculated political union that Francisco and Marina orchestrated. [citation needed] Through this marriage, Francisco became a wealthy man. Beatriz brought to the marriage the encomienda of Tlapa, the third largest encomienda in New Spain. This marriage was an important source of funding for Francisco´s expedition. Beatriz reported that her husband had died in great poverty, since their encomiendas had been taken away from them due to the New Laws, and that she and her daughters lived in misery too, a shame for the widow of a conqueror that had provided such valuable service to his majesty. This, as most reports from the early days of New Spain, both positive and negative and regarding all things, have been proven to be false, part of the power struggles among settlers and attempts to exploit the budding new system that tried to find a way to administer justice in land the king could not see nor the army reach. Francisco, Beatriz and their children actually ended their days comfortably. ^ a b Flint, Richard; Flint, Shirley Cushing. "Francisco Vázquez de Coronado". New Mexico Office of the State Historian. Retrieved October 1, 2014. ^ Flint, Richard, Shirley Cushing Flint. "Coofor and Juan Aleman". New Mexico Office of the State Historian. Archived from the original on 15 April 2013. Retrieved 27 June 2012. ^ "Hitchin' To Quivira by Tyler Jakes". Https:. Retrieved 23 May 2017. Wikimedia Commons has media related to Francisco Vázquez de Coronado. Wikisource has the text of a 1911 Encyclopædia Britannica article about Francisco Vásquez de Coronado. "Coronado, Francisco Vásquez de" . Appletons' Cyclopædia of American Biography. 1900.